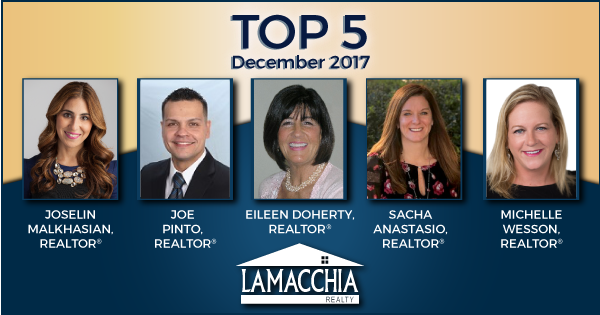 Waltham, MA – Lamacchia Realty, Inc. has released their “Top 5 Producing Agents,” for December 2017! This program recognizes Lamacchia Realty agents with the top five highest transaction numbers or sales for the month. December 2017 winners of the Top 5 are Joselin Malkhasian, Joe Pinto, Eileen Doherty, Sacha Anastasio, and Michelle Wesson. Joselin Malkhasian is a Realtor working with both Buyers and Sellers in the Greater Boston Area. She is an expert at guiding her clients through the home buying and selling process to make sure their needs are met. Joselin is one Lamacchia Realty’s top agents, consistently selling over 30 homes each year and is a member of the Lamacchia Realty 2017 President’s Club. Click here to watch Joselin’s Bio video, or to learn more about Joselin, click here: Joselin Malkhasian. Joe Pinto has been a REALTOR® since 2014 and started his career at Lamacchia Realty. He is one of our top producing agents and provides bilingual services to Portuguese speaking clients. Joe is a member of the Lamacchia Realty 2017 President’s Club. To learn more about Joe, click here: Joe Pinto. Eileen Doherty grew up in Woburn and resides in the area to this day. With her expert knowledge of Woburn and the surrounding towns it is no wonder that she has been the top agent in Woburn for over twenty-five years! Eileen is a member of the Lamacchia Realty 2017 President’s Club. Click here to learn more about Eileen Doherty. Sacha Anastasio has been a Realtor for over 10 years. She has extensive knowledge of the Watertown area as well as the South Shore of Massachusetts, giving her buyers and sellers a broad range of locations to consider. To view Sacha’s bio video click here, or to learn more about Sacha, click here: Sacha Anastasio. Michelle Wesson has been a Realtor since 2004. She assists and advises home buyers and sellers all over Worcester County on a daily basis. She joined Lamacchia Realty in 2014, is a mentor to many new agents in the company and also served on the company’s advisory committee. Michelle is a member of the Lamacchia Realty 2017 President’s Club. To hear what she has to say about being a part of Lamacchia Realty, click here. To learn more about Michelle, click here: Michelle Wesson. Lamacchia Realty is steadfast in enriching agent success with weekly company-wide training and coaching sessions as well as by recognizing outstanding agent performance. As a full-service Real Estate Brokerage, they serve all of Eastern and Central Massachusetts, Southern New Hampshire, and more recently Rhode Island. Although they are based in Massachusetts, they are a proud member of Leading Real Estate Companies of the World® which means they can further help refer and close transactions throughout the country and the world.